Ryan and I have a habit of sand-bagging one another. He takes me on rock climbs that are way too big and way too hard for me. 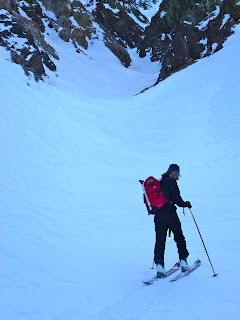 I take him on ski tours that he says are hard. He sure doesn't look as though it's hard for him. Maybe when he says it's hard that means that I picked a stupid objective. That could be closer to the truth, as we have yet to ski a "classic" itinerary together. Nor have we skied real good snow. And these things have been my idea. Ryan is a nice guy, he's probably being diplomatic, wrapping his displeasure with the conditions up in expressions of exertion. Ryan contemplates early 20th century hardiness and handiness. Remnants of the "Hanging Valley Mine" aerial tram. It's true, I like adventures. I like going new places. In the Sierra, those new places are getting weirder and weirder. Not necessarily fewer, just weirder. Speaking of weird... thin facets over creekside rocks give way to icy creek crossing. Not so stoked... Do whatchya gotta do. What does the Hanging Valley hang over? This guy: The Hangover Chute? frantic bare-boot step kicking, abundant fitness, and a reluctant quest for Jed-venture. We raced approaching shadows up between the mining shafts and across the Hanging Valley itself to Mount Tom's classic South Bowl corn run. January corn is a different beast. It's a little more textured and a little softer than its spring counterpart. It germinates on just the steepest and most southerly aspects during the cooler months. It ripens during the shortest window each day. It cooks up only when wind-pressure and transport has already firmed up the snow surface and when a couple weeks of clear weather bring about the needed melt-freeze metamorphosis. In these conditions, corn skiing is the best skiing to be had. "Fair weather" skiers hang 'em up or head to the terrain park when it gets this way. 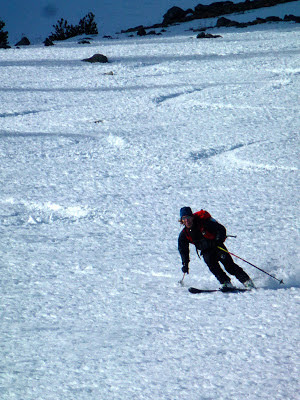 "Fair weather" Bishop skiers head to the boulders around this time. And it's their loss. Laugh all you want, but drought skiing is still skiing. See, it's good. Fattys with rocker don't hurt here. Heck, they're nice 'most anywhere it is less than rock hard. Deep corn, deep wilderness, big smile. keep my skis on for the duration. The two spots I removed them are already behind us. prudently removed his a few more times. The race through the sage, connecting snow patches along the Horton Creek road. I like that it looks like Ryan is skiing on a rainbow in one of the photos. Nice Jed-venture it looks like!